This stunning wedding lingerie collection is handmade in the UK from crinkle silk chiffon and is embellished with a stunning floral applique. The flowers on the applique are laser cut with laser cut detail and then embroided with silver and ivory threads. 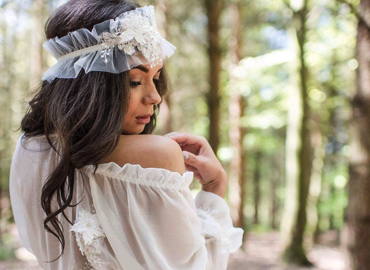 This exquisite collection of handmade wedding lingerie is a the most stunning of our ranges. High end and totally desirable. The combination of silk chiffon and Chantilly lace is above anything else you will see when looking for your wedding lingerie pieces. We have a gorgeous collection of wedding lingerie and lounge wear. We have picked some of our best pieces and combined them to make beautiful nightwear sets. Perfect for your wedding night, honeymoon and married life.